It's a complicated issue to study, and that's led to some confusing public health messages, the researchers noted. The new report does not put those questions to rest. But experts said it does suggest that if people already drink, they would be wise to minimize it. It also suggests people shouldn't seek health benefits by having that second glass of wine each night, said lead researcher Andrew Kunzmann, of Queens University Belfast, in Northern Ireland. The study, of nearly 100,000 older U.S. adults, found that lifelong light drinkers were somewhat less likely to die over the next nine years. That was in comparison to both non-drinkers and heavier drinkers. "Light" drinking was defined as one to three drinks per week for both men and women -- a drink being a 12-ounce beer or a 5-ounce glass of wine, for example. Kunzmann stressed that the results do not prove that light drinking, itself, brings any health benefits. "We urge caution in interpreting these results," he said. There could be many other things about light drinkers -- higher incomes, better diets or higher exercise levels, for example -- that explain their greater longevity. Kunzmann said his team tried to account for as many of those factors as possible, but couldn't weigh everything. A researcher not involved in the study was more blunt. "It's probably not the light drinking," said Timothy Stockwell, who directs the Canadian Institute for Substance Use Research at the University of Victoria. "It's probably something else about those people." But what about the evidence tying light to moderate drinking to a lower risk of heart disease? Over the years, many studies have suggested that benefit -- but they've had flaws, Stockwell said. One major issue, he explained, is that former drinkers are often lumped in with "non-drinkers" -- and some of those former drinkers may have quit for health reasons or concerns about their drinking. In his own research, Stockwell has found that when you account for those study flaws, the "benefits" of moderate drinking disappear. Kunzmann agreed that the former-drinker issue is a problem in many studies. But older adults in this study were asked about their lifetime drinking habits -- and death risk was lowest among people who'd been, on average, light drinkers their whole adult life. Over nine years, nearly 10 percent of the study participants died, while almost 13 percent developed cancer, the findings showed. 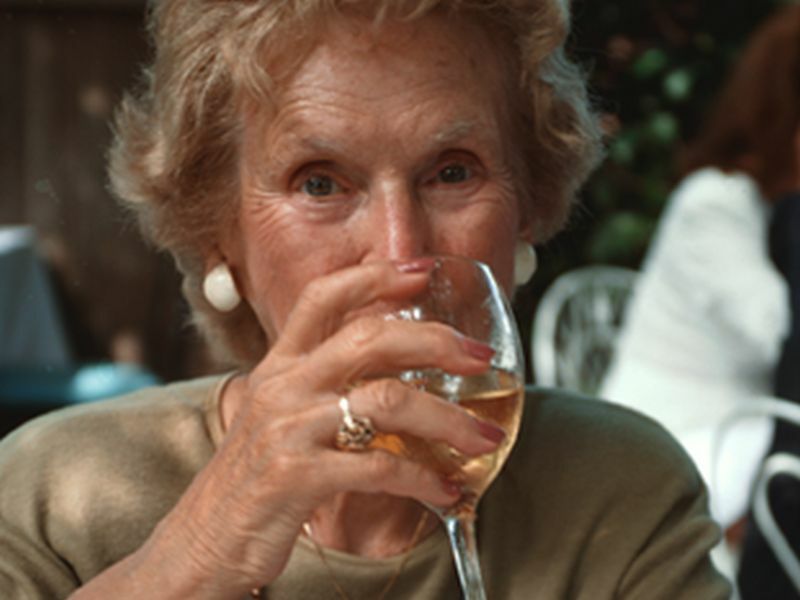 Compared with light drinkers, lifelong non-drinkers were about one-quarter more likely to die. Meanwhile, the risk was 19 percent and 38 percent higher, respectively, among men and women who drank heavily. ("Heavy" was defined as two to three drinks per day, for both sexes). On the other hand, the risk of developing cancer tended to inch up the more often people drank -- especially for alcohol-related types, such as cancers of the throat, mouth, esophagus and liver. So, when the researchers looked at the combined risk of developing cancer or dying, light drinkers still came out on top -- but not by much: Non-drinkers were 7 percent more likely to develop cancer or die than light drinkers were. That risk was 10 percent higher among heavy drinkers, and 21 percent higher among "very" heavy drinkers (three drinks or more per day). The findings were published online June 19 in the journal PLOS Medicine. For now, Stockwell said, there is no scientific consensus on what a "low-risk" level of drinking might be. But he agreed with Kunzmann on the bottom-line message: If you already drink, minimize it -- and don't start drinking more because you think alcohol is good for you. "It's unlikely you'll become less healthy by cutting down on your drinking," Stockwell said.